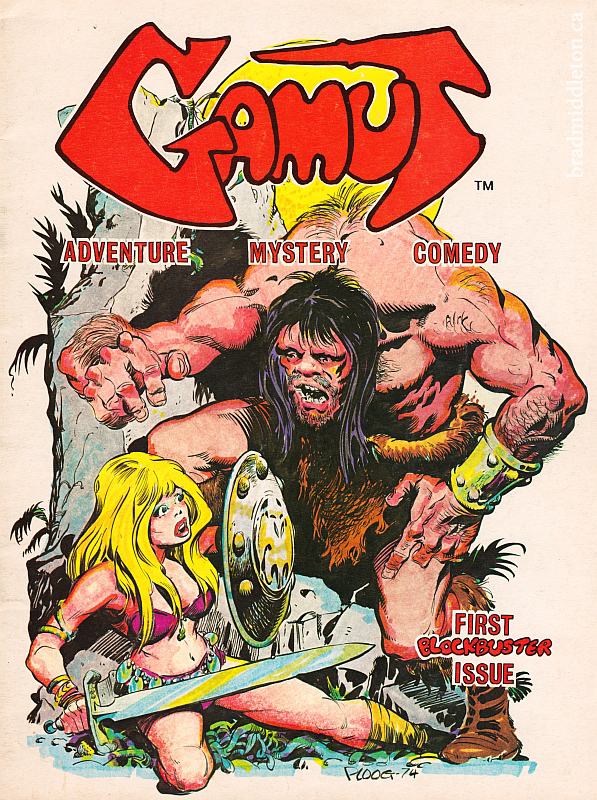 In the mid-1970s, Sheridan College in Oakville, Ontario, produced four (or possibly five) issues of a comic magazine called Gamut. At the time, the college ran a "Cartooning" course, which was geared towards comic strip and comic book creation. As such, the 'zine primarily featured student works spanning fantasy, superhero, and other more traditional genres--as well as a spattering of horror. The cover artwork was illustrated by professional artists of the day, including Mike Ploog, Will Eisner, and Bernie Wrightson--all of whom were at one time guest lecturers at the college. I unearthed issue #1 at The Beguiling in Toronto, and have included some of the more interesting aspects below. And, being a huge Wrightson fan, I'm now madly searching for the remaining issues--since it appears as though some rare work of his was reproduced therein (and he contributed the covers for issues #3 & #4).